Belmont Aparthotel in Bansko Ski Resort, Bulgaria. 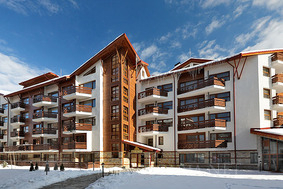 Book Belmont Apartments in Bansko online. - 10 % discount until 01 Nov 2018. - 7=6, 11=9, 14=11 during 01-27 Dec 2018 & 04 Jan - 15 April 2019. Location: Belmont aparthotel is situated only 5 min away walking distance to Gondola Lift, right behind Grand Montana. Accommodation: The aparthotel offers 71 Apartments. One-bedroom apartments consist of a bedroom, living-room with folding sofa, luxury bathroom with shower, hair dryer, terrace. Two-bedroom apartments consist of a bedroom, twin room, living-room with folding sofa, one or two bathrooms with shower and hair dryer. Apartments are equipped with TV with fine selection of satellite channels and in the living-rooms there is 21` TV set with DVD, mini-bar. All have central heating. RESTAURANT IS AT GUEST'S DISPOSAL IN GRAND MONTANA - the building next to Belmont.